For Valentines Day this year Muscle Man Surprised me with Race Entries for us to the Fueled by Fine Wine Half Marathon in Dundee, OR including an overnight stay near the race. 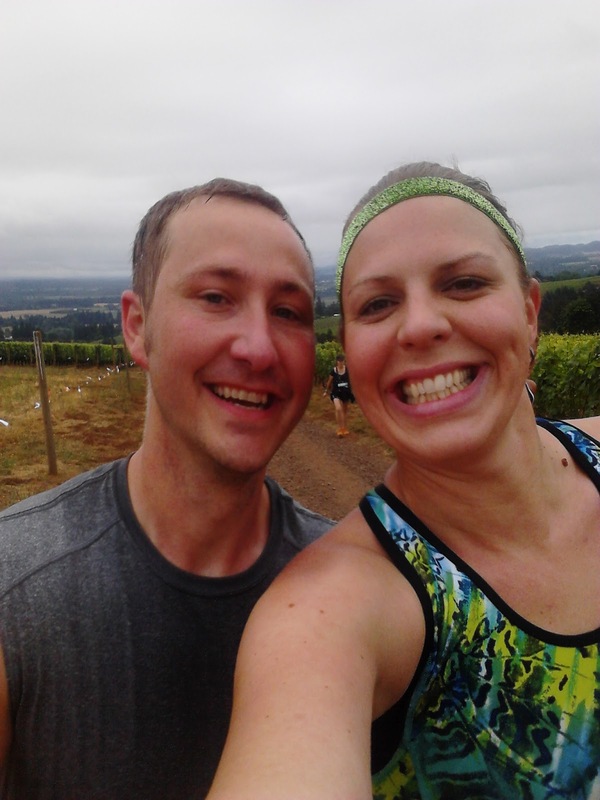 At the time this was going to be his First Half, but I quickly convinced him otherwise, once I checked out the “Hilly but Beautiful” course I knew it would not be a great for his first time. The gain in elevation of the course was CRAZY, with 3 big hills of over 1 mile long, and mixed terrain. 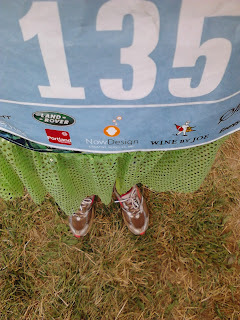 I was not excited about the race especially when I was having foot pain going up and down hills. We dropped the Little Studs with the in-laws in Lincoln City, OR which was where we would start Vacation after the race. We then ventured around to get our bearings and find a place for Dinner. Golden Valley Brewery in McMinville was FANTASTIC, relaxing and a great fit for us. Our hotel was less than ideal but was super close to the start for the 7AM call time. Parking and Honey Buckets were a breeze, we even picked up our packets that morning including an AWESOME dryfit Nike Shirt gender specific thank you!! The number of Super Fit looking folks was impressive, way to go Oregon!! I felt a bit self-conscious being one of the bigger/taller gals in the crowd. Going into this race I was WORRIED about the HILLS, the terrain, everything.. My buddy Kim had run it before and shared the gory details.. As I mentally prepared I kept repeating in my mind "It is not about the Finish time! Enjoy the Journey." 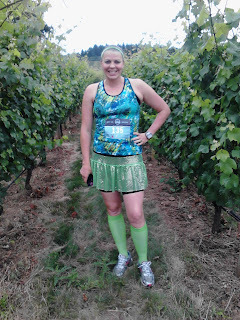 The race started in Stoller Vinyard which was so pretty!! 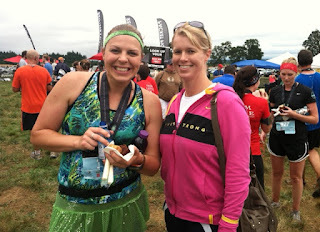 We snapped a few pre-race photos then waited and waited… the race started 20 minutes late. The race start was a little wonky, they did not rope off the start corral type area so people fed in from everywhere and were in no way sorted by pace. We finally crossed the Start and were in a sea of people, we could not get out…my legs wanted to run but there was nowhere to go. We did the best we could to weave and get into our rhythm. From Mile 1 the markers were off by .3, not sure why? 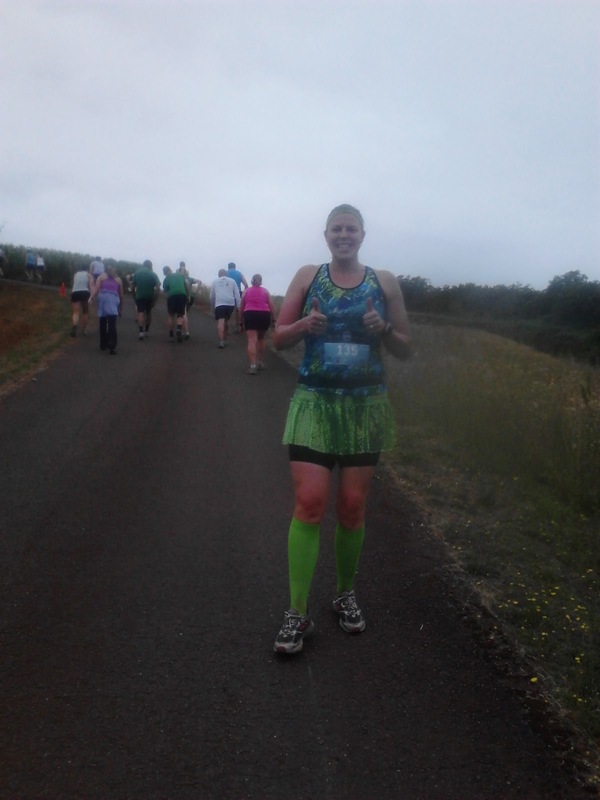 At mile 2 we were already climbing..and it was a big hill… CRAP!! It honestly crossed my mind in that moment that I may not Finish the Race...If I was already dying on this hill how would I managed the rest??? My right calf was on FIRE.. Just then my MM said he was feeling bad.. So we walked.. This was the ONLY boring section of the race because it was on pavement and sort of Residential.. 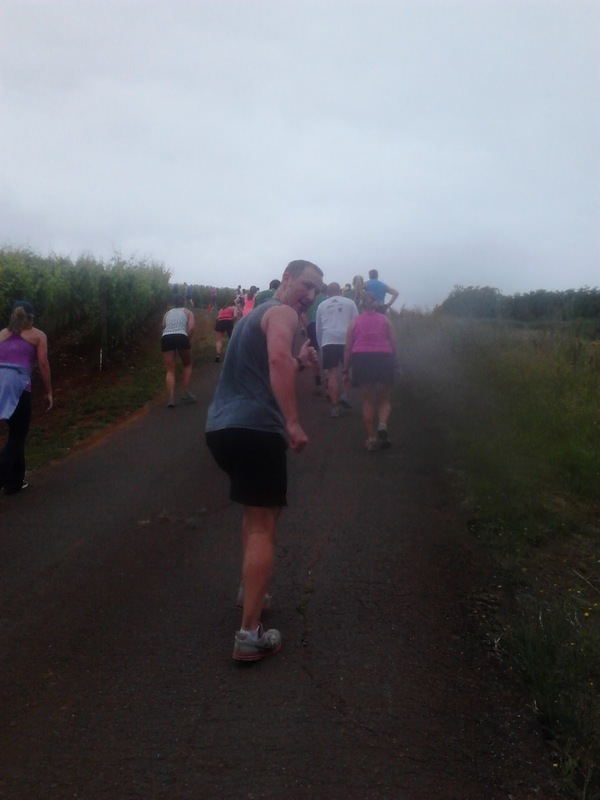 Soon we were on red dirt paths amongst the vineyards and wineries. After the initial fear I LOVED EVERY MINUTE!! It was hard, some of those hills were CRAZY... but we walked when we had to and ran when we could. 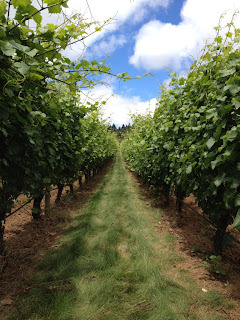 I soaked in the BEAUTY of the day, there was a mist in the air as we toured the local Oregon Wineries on foot. AMAZING!! Truly amazing. 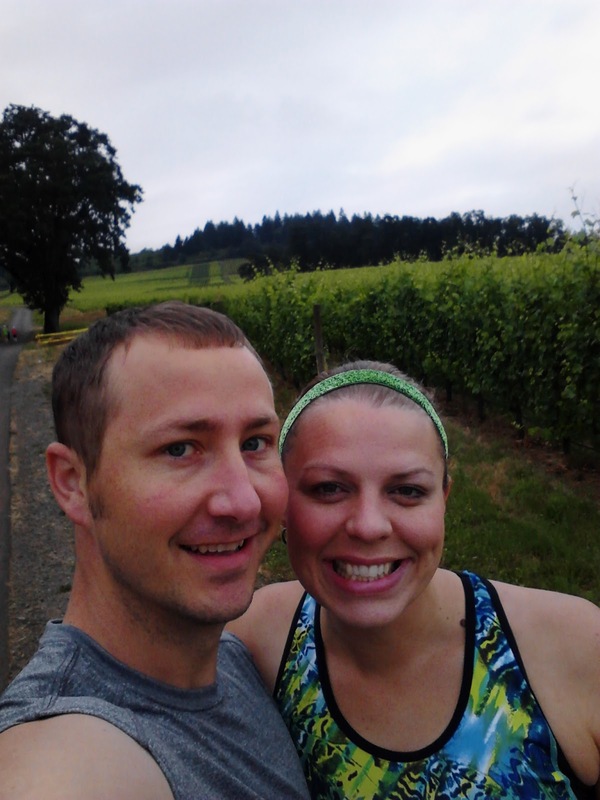 I was so glad to have my husband by my side, stride-for-stride, I felt bad for people who were on their own. This course is meant to be enjoyed WITH someone and not to be taken too seriously (in my opinion). There were some odd folks along the way: the guy who ran up the hills and walked the flat parts who also tied his shoes 4 times that I saw, the gal with 2 handhelds, and many many people with the wrong gear…shorty shorts, no socks, bouncy-bouncy chests, lady in full length pants, men with white shirts and chaffing…newbies?? Not sure, but the number of people in the wrong gear was astonishing. 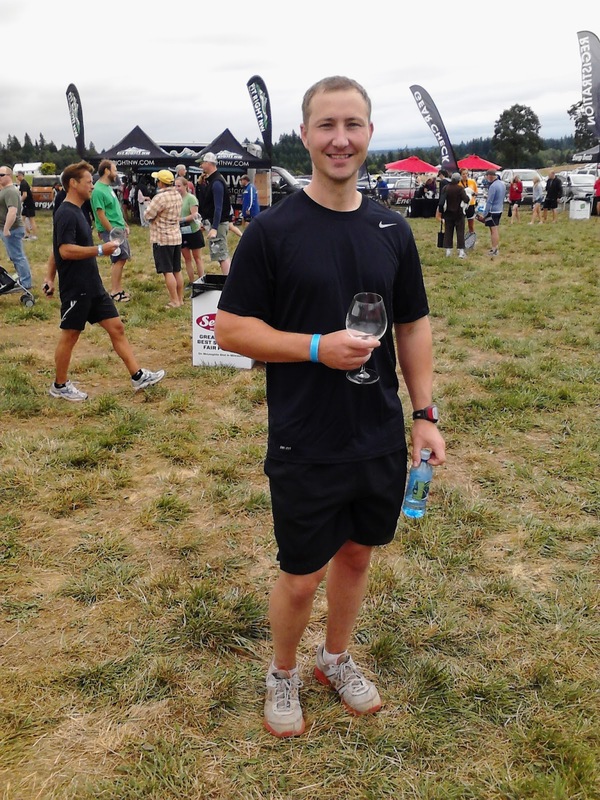 I have never done a trail race, but after this race I feel like I have, over 70% of the course was on dirt, grass, gravel, etc. It was TOUGH!! Those who were really pushing did not look happy. But I was not in it for the Finish Time, I wanted to Enjoy the Run.. And I did!! At one point the Hill was SOOO STEEP we had to take a photo..or 2.. I spent a lot of time people watching, photog spotting and soaking in the views. I was in the ZONE, not the Running zone but in the ZONE of being truly present in the moment. The water stations were great and included chews and Gu’s. There was a sign which read “Run Now. Wine Later.” Made me laugh because this course would normally have made me a huge Whiner for sure.. and I liked the play on words..As we were Running around the Domain Serene vineyard out-and-back I spotted a photog and started to think of fun poses, thankfully my husband is my dorky equal so he was game.. the result was this. The last 5K or so of the race was a lot of Downhill, sloped, grass, etc... it was a total adventure. When we hit pavement I could see the Finish, I got a surged of energy, we knew that the last 200 yards or so would be slightly uphill. 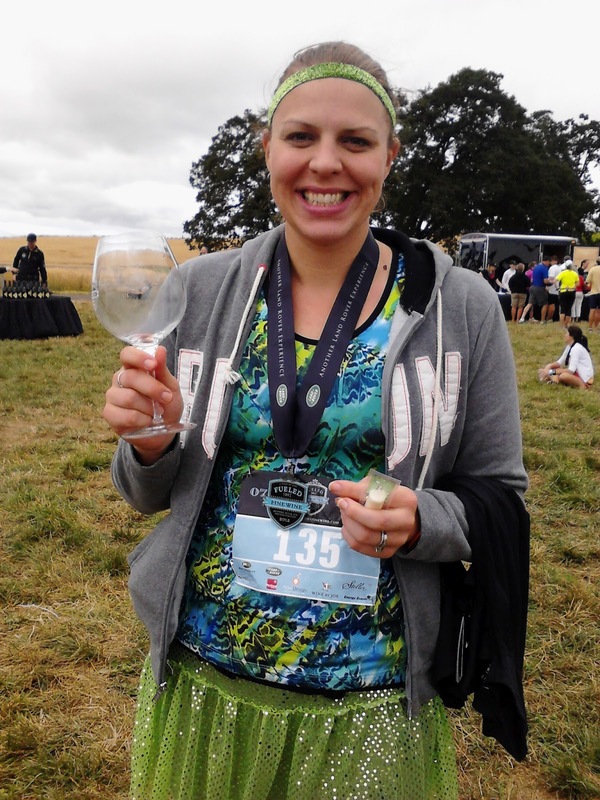 For our efforts we got stellar medals and Wine glasses, to use for the wine tasting. AWESOME event! I cannot say enough.. If you are up for a CHALLENGE and to enjoy the journey this race is for you. The course changes every year so who knows what you will be in for. I teased Muscle Man for Months that I would never let him pick another race for us….but I eat my words, it was AWESOME. My shoes are forever ruined by the red dirt paths that captured my heart. Sounds like a great, though challenging, course! I would run for wine any day! Oh my, you actually made that course sound like fun. I'm so glad you guys enjoyed the journey. That is so cool, the two of you getting running photos! Where are the T-Rex arms??????? The pictures of you and your hubby are really really great...you definitely need to shell out the money for those, super frame worthy! Awesome! It sounds like so much fun. Maybe a girls weekend next year?! You two are so cute! My hubs and I are doing a race together in a couple weeks, but his main objective is to beat me (yeah, not going to happen!) so I don't think we'll get those super adorable pics like you guys did. So nice that you ended up loving this race... it looked really beautiful! Congratulations!!! What a great getaway/mini vacation!! 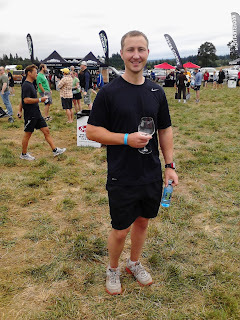 I was in wine country on the weekend too...for a 10k. 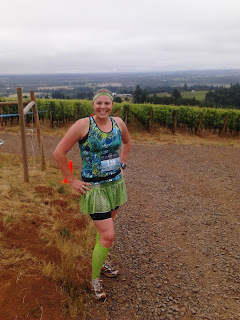 Also super hilly but beautiful views. I didn't get a cool wine glass like yours though, that is awesome! Y'all are so cute! Way to go! 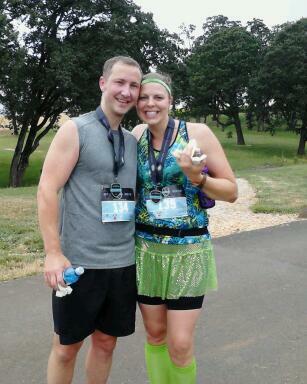 Wish I could get hubby to run with me! Those pics are awesome! 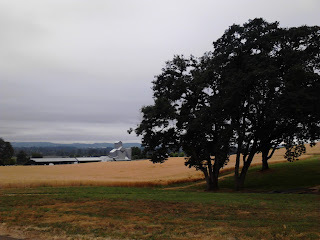 I used to live in Lincoln City, Stayton, and also Mcminnville. The rolling hills and vinyards bring back so many memories. Thanks for the race report. I'll have to run it with my wife if we're ever back there.